Discount tickets to Motown - The Musical continue to top the charts both on Broadway and now in the Windy City with its new national touring production, said Marta Ault at online discount ticket marketpace BuyAnySeat.com. The inside story of the 1960’s soul music hit factory has grooved at over 100 percent capacity since it opened at the storied Lunt-Fontanne over a year ago, while its new top-shelf national tour opened at the historic Oriental Theatre in Chicago May 1 and continues to pack the vaunted 3,250-seat venue. Motown, currently at the Lunt-Fontanne on Broadway, also now has a first-class touring production playing Chicago (above) and headed for San Francisco and Cleveland next. The sweet sensuous sound of soul. It still sells, just as it has since the early sixties. This may explain why Motown - The Musical has been such a solid hit at the Lunt-Fontanne on Broadway (albeit more with audiences than critics) for more than a year now. It might also explain why the musical has now launched a top-flight national tour, which opened to rave reviews at the ornate 1926-era Oriental Theatre in Chicago on May 1 and performs through August 9, 2014. From there, the 29-city tour hits the Orpheum Theatre in San Francisco from August 15 through September 28 and opens at the State Theatre in Cleveland, Ohio on Friday October 3, 2014. “Motown, like its incredible catalog of over 100 hits, is very popular,” said Marta Ault at online discount ticket marketplace BuyAnySeat.com. “That’s why we’re proud to be able to offer theatre-goers the most complete and continuously refreshed selection of discount Motown tickets, with a Worry-Free Guarantee to protect their purchase,” added Ault. Performing on Broadway since March 2013, the musical about Motown Records founder Berry Gordy, starring Brandon Victor Dixon as Gordy and Valisia LeKae as Diana Ross, has proved to resonate very successfully with audiences. Berry Gordy helped develop the careers of Diana Ross, Michael Jackson, Stevie Wonder, Smokey Robinson, and Marvin Gaye. According to press notes, the show charts Gordy's "incredible journey from featherweight boxer to music heavyweight... and it tells the story behind the hits as Smokey finds his unique voice, Diana skyrockets to stardom, and Berry fights the odds to turn his improbable dream into a triumphant reality." Broadway theatre-goers give Motown an almost perfect rating of 4.8 out of 5 stars, while critics are less enthusiastic with a 2.9 out of 5 rating. Despite this somewhat curmudgeon-like critical appraisal, attendance capacity has remained at the top of the charts since the production opened, based on tracking data compiled by entertainment-link.com. In addition, the play received four 2013 Tony Nominations, including Best Performance by an Actress in a Leading Role in a Musical (Valisia LeKae), Best Performance by an Actor in a Featured Role in a Musical (Charl Brown), Best Sound Design of a Musical and Best Orchestrations. And, it grabbed two 2013 Outer Critics Circle Nominations: Outstanding Actress in a Musical for Valisia LeKae and Outstanding Featured Actor in a Musical for Raymond Luke as a young Michael Jackson. 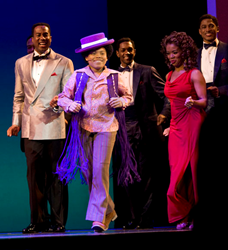 Costume designer Emilio Sosa, with everything from casual resort wear to formal couture beaded gowns required to be part of the mix, says Motown is “one of the largest costumed shows to hit Broadway in a very long time.” There are an estimated 350 outfits, 70 percent of which are his designs, and 135 different wigs. Then there’s the choreography by Patricia Wilcox and Warren Adams. And, of course, the soundtrack of 60 classics from the legendary Motown catalogue, including: “Get Ready,” “Shop Around,” “Where Did Our Love Go,” “What’s Going On,” “My Girl,” “Tears of a Clown,” and “Ain’t No Mountain High Enough.” Between 1961 and 1971, the dynamic Detroit hit factory had 110 Top 10 hits. Concerning the new touring cast’s debut run in Chicago, reviewer Chris Jones of the Chicago Tribune, in his May 8, 2014 review of the 2 ½ hour production, wrote: “The songs are why most people are coming for a glamorous downtown night out and they are performed with style, panache and elegant choreography, often with a precise re-creation of signature Motown moves." To shop for discount Motown tickets, visit BuyAnySeat.com. To save even more, enter coupon code "BAS2014" at check-out. In addition, the site, which is PCI-compliant and Norton Secured, also provides customers with a complete Worry-Free Guarantee on all ticket purchases. Based in Denver, Colorado, BuyAnySeat.com is a subsidiary of Denver Media Holdings. For more information, please visit http://buyanyseat.com.